My business is providing solutions for a well-behaved puppy. Overwhelmed by your puppy’s non-stop biting? Tired of your furniture being chewed? Flustered that your puppy won’t pee outside but, instead, she squats on your rug? Let my puppy training solutions provide answers to these challenges. I’ll bring relief to your home with practical puppy training solutions via my home-based programme. 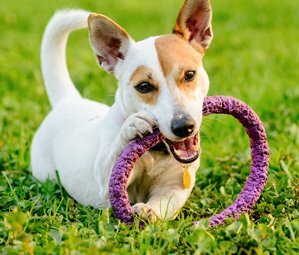 Ready to delight in your puppy’s behaviour? I’ll customize every session to maximize your puppy’s progress. Read more about my training package for puppies up to 20 weeks old. Have you thought about your puppy’s first week home? You’ll be her teacher, caretaker, best friend, and more for years to come—24 hours a day, 7 days a week—no matter what kind of day you’ve had. Establish house rules from the start for good behaviour from the beginning. I’ll help your puppy grow into a fun, well-adjusted dog who you’ll enjoy for years to come. Using effective, gentle training methods, your puppy will learn real-life manners like come and lead walking. Plus, we’ll address biting, crate-training, toilet-training, and much more. Most importantly, we’ll train where you need your puppy to behave—in your home, your garden, your favourite park, or wherever results matter most. ● Manners every puppy should know—sit, down, come, go to your bed, to relax when asked, and lead walking. ● House training—where to do her business, and when. ● Chewing—what she’s allowed to chew—her toys only. ● Biting—what she’s not allowed to chew—you or your furniture. ● Home alone—prevent separation anxiety by teaching your puppy to cope with being left alone. 6 Training Sessions for £320.00 . Pre-Puppy Preparation Package and 6 Training Sessions for £435. Need extra support? I'm happy to help! The Life Skills approach to raising a puppy enable puppies to develop the skills they need to live in harmony with their human families and the society in which they live. Let me bring harmony to your home via positive, effective puppy training solutions. Recommended: Veterinarians recommend my services to their clients. Knowledgeable: Up-to-date and scientifically-proven techniques. Experienced: Life Skills for Puppies Trainer. Convenience: Address your puppy concerns, where it matters—I’ll come to you! Support: Ring me up with questions, I’m happy to help! Let me be your personal puppy behaviourist. I'll provide relief in every session.